Timisoara was our first stop during our time in Romania and it couldn’t have been a better welcome. Following the previous few weeks of near constant movement, it was nice to be able to stop for a week and really dig in. 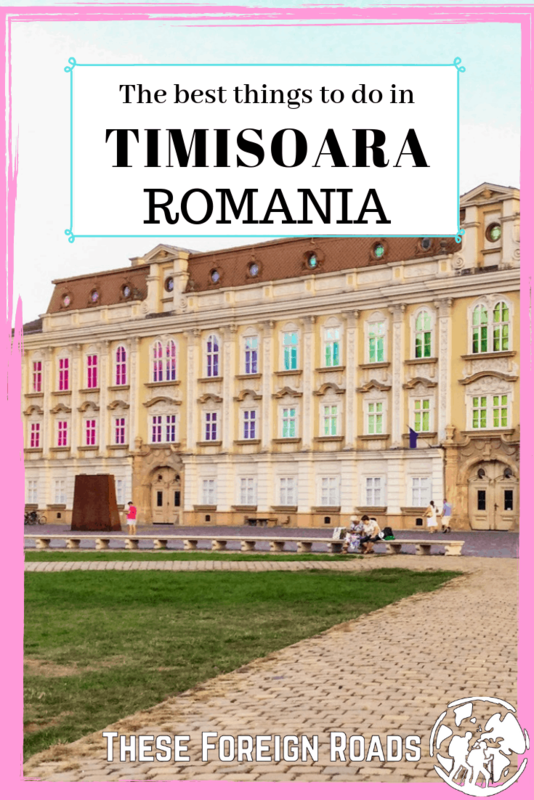 For what was a relatively unknown city to us at the time, we were truly impressed at the number of fantastic things to do in Timisoara. 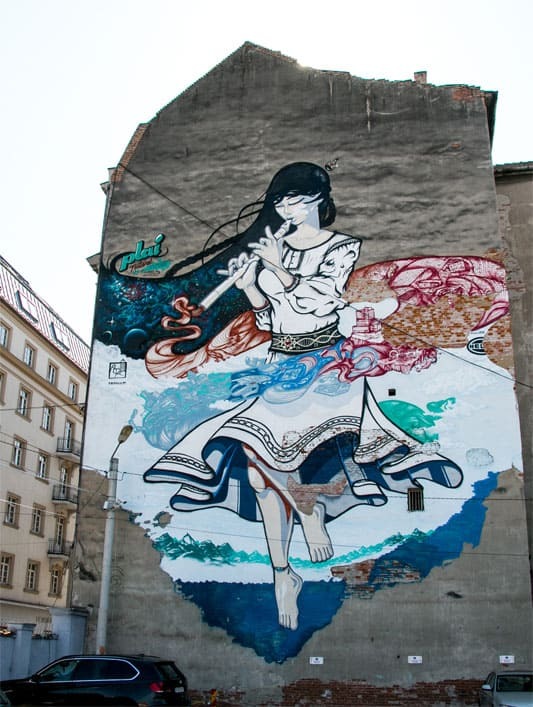 The city is located in the far western ranges of the country, wedged between Hungary and Serbia. Due to its convenient location, it’s often the first city many encounter when entering Romania overland from the west. If you’re entering elsewhere, you can easily rent your own ride and check it out that way. 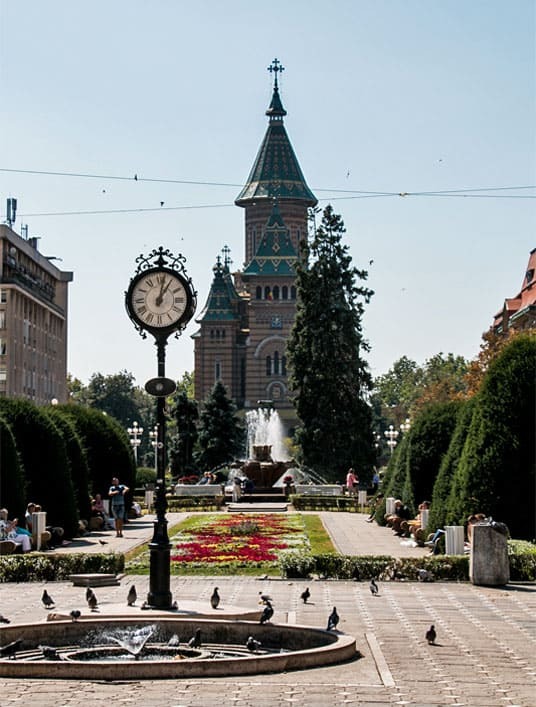 Wonderful architecture, vibrant green spaces and rich history will keep you plenty busy. While the funky cafes and upscale eateries will keep you well-fed during your visit. The real question is: Which square? Right in the city centre are two major gathering spots, both featuring beautiful fountains, cafe patios and some of the city’s best architecture. Victoriei Square is probably the busiest and most elaborately designed in town. A long stretch of trees and colourful flowers surrounding a fountain lead the eyes towards the grand Orthodox Cathedral on the south end. A varied selection of bars, cafes and chain restaurants line this the green space of this tourist-oriented gathering spot. A little further north is Union Square, a wide open area surrounded entirely by beautiful baroque buildings. There are a lot of great cafes here as well, a perfect spot to relax in the evening and mingle with locals. Trams are commonplace throughout Central and Eastern Europe. 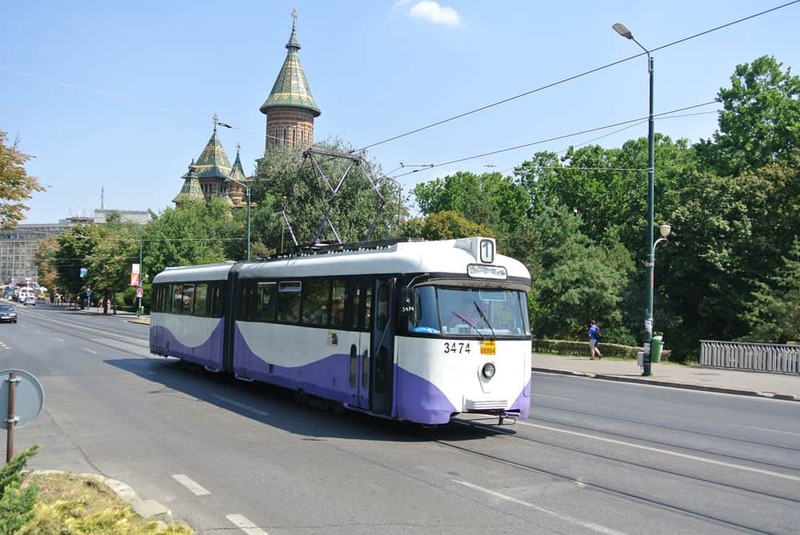 From Prague to Warsaw and all the way down in Sarajevo, these electric streetcars are the standard of urban transit. In the majority of these cities, the tram systems are being upgraded. Newer carriages are replacing the old, Soviet models, and signalling is almost completely automated. However, though newer models do make a regular appearance in Timisoara, the old, rickety carts are an experience in themselves. Take a roll through the city, while the old tram creaks and shakes as it bumps along the uneven rails. Listen to the brakes squeal before the conductor steps out to manually switch the tracks at an intersection. It might not be the most exciting experience you can find in Romania, but something like this won’t be around much longer. 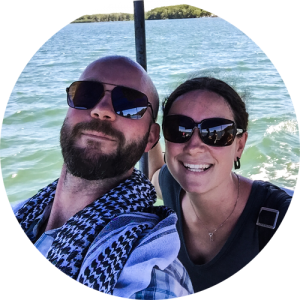 Something we promote nearly everywhere we visit is a free walking tour. 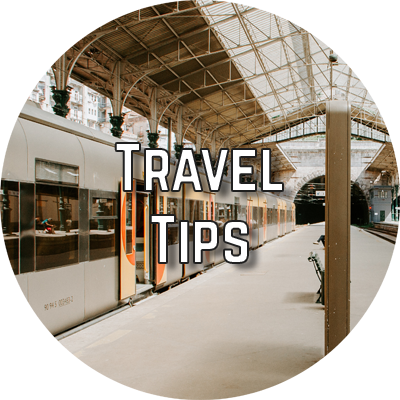 These are such a fantastic way to get your bearings and have a quick crash-course on the history of a destination. 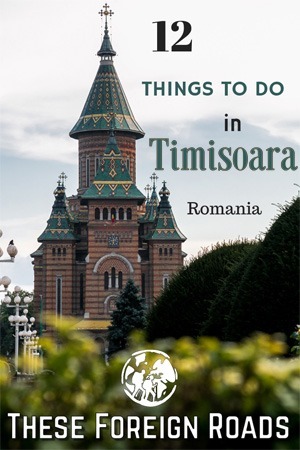 The free tour in Timisoara runs Mondays, Wednesdays, Fridays and Saturdays at 3 pm and runs roughly two hours. You’ll walk through the old town, to the old fortress walls and city centre. The knowledgeable guides will break down the history of the region, changes since the fall of communism, and plans for the coming years. Take a peek back a few decades into life during the communist era. Located in an old house, the museum holds relics of a time most would rather forget. During those many years, products available to the general public were fiercely regulated. Furniture and home decor were basic, functionality reigned over design and beauty. Even artwork and music was laden with propaganda. The design of the museum is as though you’re wandering the halls of an occupied home during that time. Open cupboards and drawers, sit on a bed and observe the walls, see the tools and toys on the shelves. 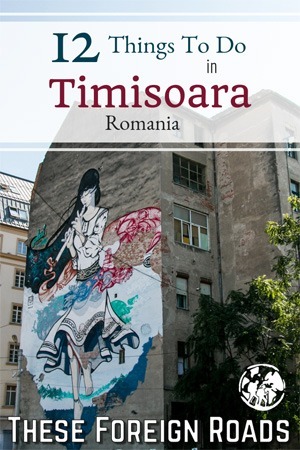 Experience first-hand what it must have been like living in Romania under Communist rule. Though opinions tend to be mixed, there were more than enough who had it with life under communism. In mid-December, 1989, a short but ultimately successful revolution began in Timisoara and spread throughout the country. The museum details the revolution with displays, photos, and monuments to those who died. It’s a very interesting and informative place to learn about the incredible changes that took place only three short decades ago. Entrance to the museum is 10 lei, with another 10 lei fee for photography. 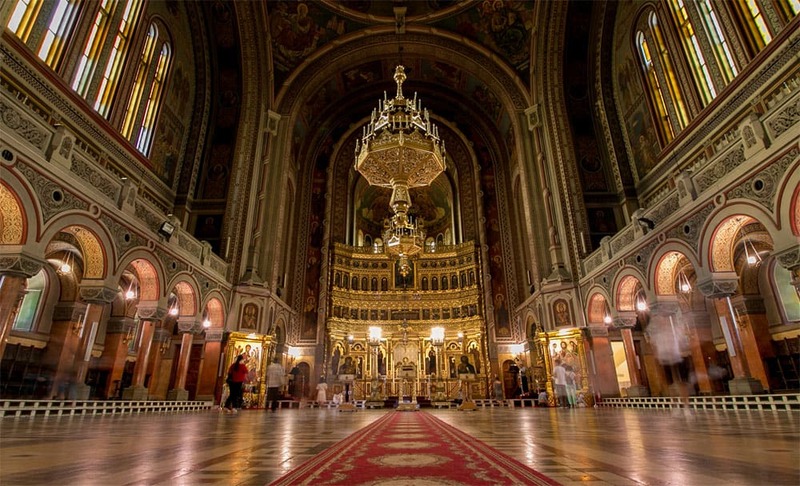 One of the most recognizable sights in all of Timisoara is the beautiful Orthodox cathedral. The stunning centrepiece of Victoriei Square can’t be missed. The design itself is a architectural breath of fresh air after seeing so many other, more classic, baroque buildings in this part of Europe. However, the real splendor is within. Step inside and bask in ornately decorated main hall; see the light shimmer on the intricate gold designs. Watch as the truly devoted make their rounds, kissing and touching the pictures and relics of saints. We’ve seen a lot of religions buildings in our travels and this is truly one of the most impressive. This Picture Does Not do justice. As former chefs, food is clearly more than just a fuel source when we travel. 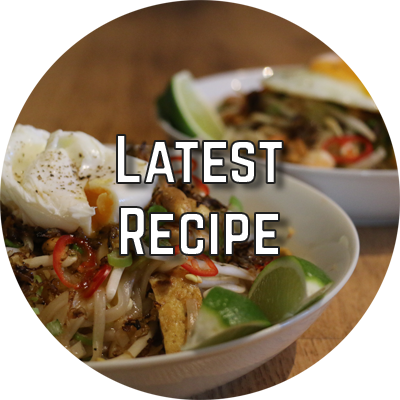 We’re constantly looking for traditional local cuisine, interesting fusions and new, modern cooking styles. Before coming to Romania, we knew very little about the culinary scene, and as a result, had absolutely no idea what to expect. We were shocked at the incredible variety of not only fantastic tasting food, but how cheap it was. As a result, deciding where to eat in Timisoara, especially with limited time, could end up being an issue! 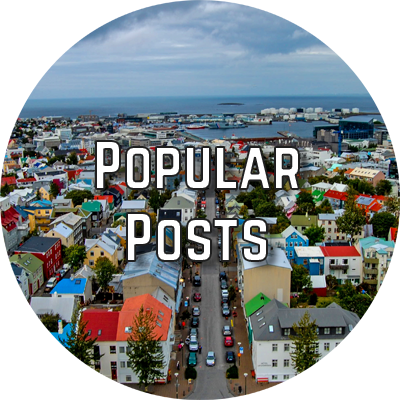 To help make your selections a bit easier, we’ve narrowed it down to our five favourites. The menu rotates daily and features nothing but a selection of three or four soups – all delicious. Each day also features at least one vegetarian or vegan option, when we visited there were both. You simply make your choice, and it’s handed to you in a paper cup – much like a takeaway coffee would. We had roasted tomato and Thai chicken, both were outstanding and very hearty. Though we did have a bit of a chuckle with the second option. Upon ordering, we were warned that the Thai was “Quite spicy.” Apparently, Romanians have a much different opinion of the word than we do. Oh yeah, they also have chocolate cake. La Căpițe is one of the hip evening spots along the Bega River. It’s an open-air patio restaurant that is perfect during the summer months. It’s known mostly for it’s cheap Romania bar snacks and often has live music on the weekends – these nights a small entry fee is occasionally charged. We spent a couple hours here one evening, just soaking up the lively atmosphere. 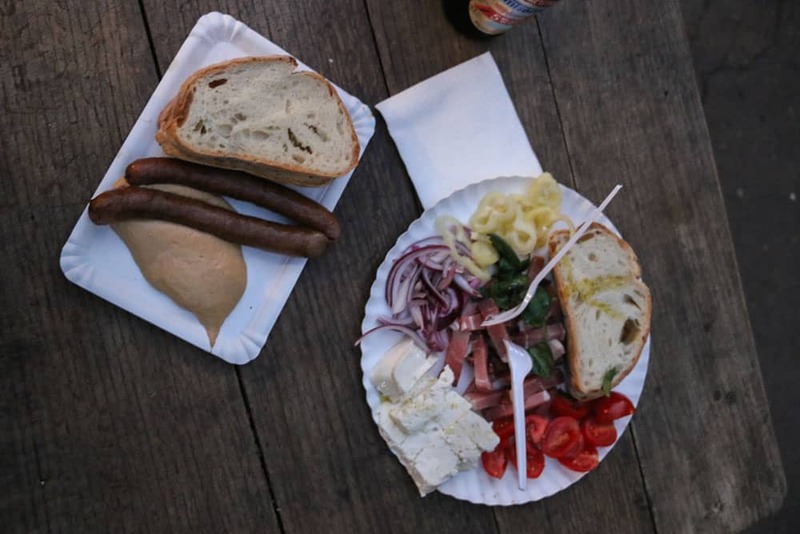 We shared a plate of grilled sausages with mustard and bread, as well as a charcuterie platter with meats, cheeses, and pickled vegetables. Throw in two 1/2 litre bottles of the local Timisoarana beer, and our total bill came out to only 41 lei, or about $13 CAD! This hip spot is wildly popular with locals and visitors alike. We stopped by on our first evening, on a recommendation of a local friend of ours. The menu features everything from soups and pasta to Asian fusion and grilled meats. We had a fairly simple vegetable soup, which helped us justify the monstrous burger that followed. The huge patty was cooked perfectly medium-well and was incredibly juicy. There was a pile of crispy bacon and melted cheese that you’d expect on any great burger, and bbq sauce poured out the sides. It was an absolute mess to eat but was worth every splatter. Just south of Union Square, this simple sandwich shop is very affordable and delicious. Featuring classic like the Philly cheesesteak and meatball subs, as well as some more creative options, if you’re a sandwich fan, this is the place to be. Like many spots in the centre of town, there’s nice little patio to sit back on when the weather is right, and plenty of funky music. 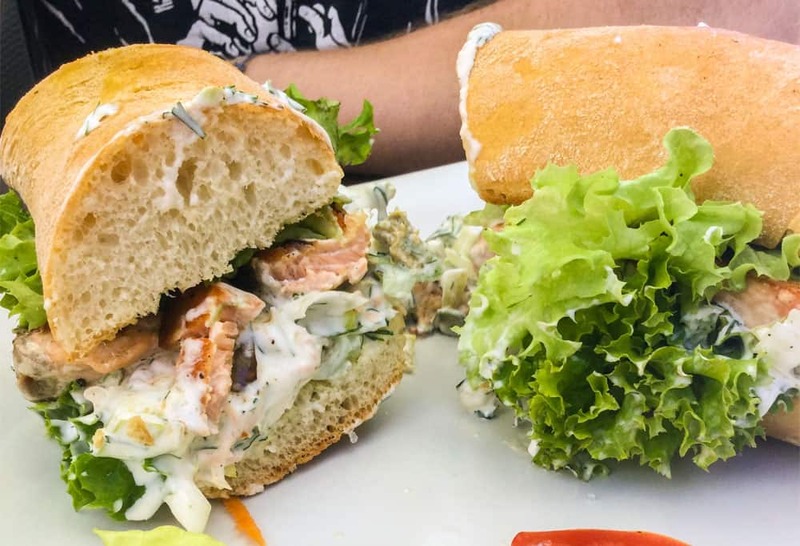 We went for the grilled salmon on ciabatta. A generous portion of salmon, creamy leek sauce, capers, dill, and plenty of greens. It was more than enough for the two of us and was ridiculously good! Finally, for those carnivores out there, get your Southern-style BBQ on at Meat Busters. Located on the edge of Union Square, it’s a little pricier than the rest on this list but is still great value for money. Grilled sausages, ribs, and pork knuckle are just a few of the delicious options available. However, their real specialty is the selection of pulled-pork sandwiches. The pork is slow roasted for 18 hours and smoked with whisky barrel wood, then mixed with their outstanding house-made bbq sauce and served on a brioche bun with pickles and slaw.